Antique clocks are the obsession of Gavin Douglas Antiques & Clocks Ltd, we specialise in 18th and early 19th century antique English clocks and French clocks in bronze , gilt bronze and marble. We stock an extensive range of antique mantel and bracket clocks and table clocks from England and continental Europe, especially France. We try to carry in our inventory examples of most types of other high quality period clocks including wall, longcase and carriage clocks.. Gavin Douglas has been an avid antique clock collector for over 30 years. He is an antique clock dealer with 28 years experience. Our French antique clocks are Louis XV and Louis XVI , Directoire, Empire and Charles X examples both figural and architectural. We particularly like pieces from the Golden Age of French clock making where the finest designs from eminent sculptors and artists combine with the technical skill of the bronze casters, gilders, chisseleurs, enamellers, dial painters, spring makers and clockmakers to make such works of art THE most desired decorative timepieces all over the world. During the Belle Epoque some of the most beautiful porcelain and ormolu clocks and garnitures were produced and fine enamel and porcelain, silver and tortoiseshell carriage or boudoir clocks became a speciality. Our stock includes English antique clocks from the Adams and Regency periods, including a large number of neoclassical examples. We carry several fine quality small antique English mantel clocks from the beginning of the 19th century in a variety of case materials including ormolu, gilt bronze, and patinated bronze clocks and examples in satinwood, mahogany and oak. Other case types we carry are tortoiseshell and silver pique, carriage and mantel, guilloche enamel and silver boudoir or mantel clocks and occasionally the small and unusual antique longcase clock. We also specialise in the antique singing bird box or antique singing bird tabbatier, from antique silver singing bird boxes and silver and enamel fusee singing bird box by makers such as Bruguier and Rochat to the later antique silver and enamel singing bird boxes, tortoiseshell singing bird boxes and gilt bronze and enamel spring singing bird boxes by makers such as Bontems and Griesbaum right through to decorative silver and gilt bronze singing bird boxes. We sell and restore small, early antique musical boxes in decorative cases such as tortoiseshell and palais royal, many of the music boxes have watercolours on ivory set into the lid. As well as antique automata singing bird boxes and singing bird cages we also sell antique automaton pieces of all kinds. Other particular areas of interest for us are antique Blackamoor clocks and blackamoor candlesticks and blackamoor candelabra and the rare and unusual genre clock. We are particularly fond of objects made from Blue John, a rare form of colour banded fleurospar, also known as Derbyshire Fleurospar. Blue John is one of the rarest stones in the world and Blue John is only found in the Treak Cliff Hill, Castleton, Derbyshire, England. Blue John has been a sought after semi-precious stone since Roman times. We stock single Blue John urns, Blue John vases and pairs of Blue John items from the 18th and 19th century. Frit, a form of Blue John incorporated with Derbyshire marbles, make fine and unusual objects such as obelisks. We currently hold two blue john clocks in our inventory that incorporate Blue John in their cases. Others areas of interest are fine antique candelabra, candlesticks, urns and vases (in bronze, ormolu, marble, semi-precious stone and porcelain), in fact pairs of high quality sidepieces in many styles and materials from the 18th and 19th century by such masters of gilt bronze & ormolu as Thomire, Ravrio, Galle and Matthew Boulton. We stock high quality antique English Regency decorative objects and table furniture such as ecriers, desk sets, small bronzes, candlesticks and objects by makers such as Weeks of Titchbourne St. We supply a large selection of antique Italian Grand Tour items, for example micro mosaics, antique ruins, small bronzes and objects. 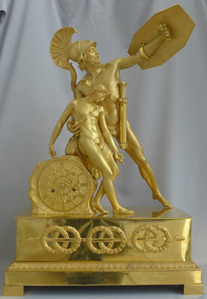 We also stock an extensive range of antique sculpture in bronze and marble from the same period and indeed some particularly stylish pieces into the 20th century including Art Deco sculpture and Art Nouveau sculpture. As members of LAPADA, CINOA, PADA and The Antiquarian Horological Society we abide by their strict codes of conduct. For example we ensure that all our clocks have their original mercury gilding or ormolu and original movements, which are fully overhauled and unconditionally guaranteed for at least one year. Travelling extensively both at home and abroad, we visit many fairs and innumerable auctions, antique shops and private homes in our search for high quality goods. We would be pleased to source particular items of any kind and would be able to photograph, vet them for authenticity and negotiate for such items. We look at hundreds if not thousands of period clocks at Gavin Douglas Fine Antiques Ltd every single week and pick at most a handful of these to try and buy for stock. 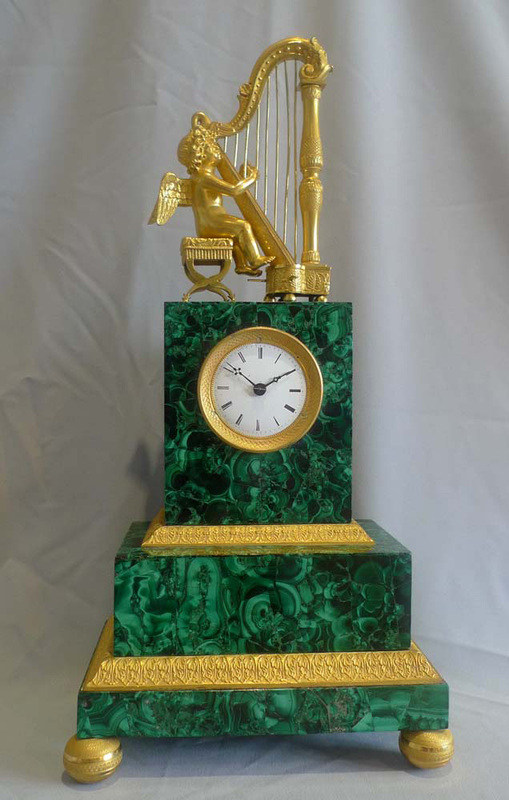 We are only interested in supplying the finest collectible clocks to our clients, many of whom rely on our knowledge and expertise entirely to find them the right piece. There are many different types and periods of Antique Clocks but we concentrate only on those that we think most aesthetically pleasing and that also give good value for money. From a Louis XV mantel clock, through small elegant early 19th century English clocks to silver and tortoiseshell boudoir or carriage clocks we will find the ones that suit your style and your pocket. Having been in the clock trade for many years Gavin Douglas Fine Antiques Ltd have built up an impressive array of the country’s finest restorers. No Clock restores itself but we have the clock repairs experts to repair and restore any part of any clock whether it be a dial repair, case repair or complete movement overhaul. We undertake some work in house, especially case repairs, and you can be sure that any clock entrusted to our teams will be looked after as if it were a museum piece. We are now offering a LAYAWAY SERVICE as we are very aware that many people might find buying an antique over a period of time easier than finding the full purchase price in one go. This is a free, bespoke service and INTEREST FREE, that we are delighted to offer, for details please contact us. Valuing repeat business we cherish our reputation amongst discerning trade and private buyers who have been dealing with Gavin Douglas Antiques & Clocks Ltd for many years. We are happy to take pieces back in part exchange as clients upgrade their collections. We arrange packing and door to door insured air-freighting as a matter of course. We now pack everything ourselves In House. If the clocks are heavy, or we feel it necessary, wooden crates are custom built for them. Regardless of weight or value all items are carefully wrapped in tissue paper, then bubble wrapped and finally packed in 2 to 4 inches of foam before being crated. A good cross section of our stock can be seen at 75 Portobello Road, London from Monday to Saturday, 10.30 am to 4.30pm. Telephones: Main office number 0044 1903 719797. Cell/Mobile number 0044 07821 805023. We regularly update our site and to make sure that you are the first to see fresh offerings of antique clocks and Grand Tour, ormolu and other objects please join our email list and you will be notified of new stock. Your email will be used purely for this and for nothing else. Nor will your email address be passed on to anyone else. Remember, please don't keep us a secret, we grew by referrals and would welcome yours.